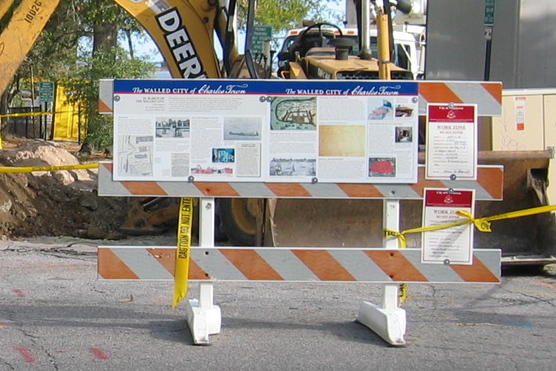 If you’ve had an opportunity to visit the archaeological dig at South Adger’s Wharf, we hope you took the time to peruse a pair of educational panels (each two feet by three feet) mounted on a construction barrier along East Bay Street. Katherine Saunders of the Historic Charleston Foundation had these elegant panels fabricated in October 2007, in preparation for the educational component of this archaeological project. Many people have commented on the quality of the images and text on the posters themselves, so we’re pleased to be able to make them available to students of Charleston’s colonial history and supporters of the Mayor’s Walled City Task Force. If you’d like to take a closer look at the posters, we invite you to view a new page on this website called simply Educational Posters.